The Fall Fly-In is hosted by the Gypsy Villa Resort, located in northern Wisconsin, on the beautiful Three Lakes-Eagle River Chain of Lakes. Join us for two nights on the island on the largest inland freshwater chain of lakes in the world! Family owned by the Safer Family for generations. Gerda, Jeff and Dean welcome you to their resort and look forward to the "seaplane group" every year. This year, there will be a Sept. 1st reservation cutoff date, and cancellation penalties. Sorry, the resort just couldn't operate with people canceling at the last minute or not showing up...they need to stay in business, too, just like everyone else. Any cabins not reserved for the Seaplane Fly-In by Sept. 1st will be offered to their other guests. Please reserve early. Gypsy Villa goes through a lot of extra effort to host us, please be courteous to them. All reservations must be made directly with the resort. Visit their website, or call them at 715-479-8644. Space is limited, first come, first served. All reservations will be for both Friday and Saturday nights. Sorry, you will need to confirm for both nights to book a cabin. Reserve early for the best accommodations. Any cabins not reserved by Sept. 1st will be offered to their other guests, and we may not have last-minute accommodations available. Within limitations, you may share a cabin with other pilots and split the cost. Regardless of the number sharing, or whether or not everyone shows up, you are responsible for the full price of the cabin. No restaurant or bar on the property, so bring your own snacks and/or refreshments. Saturday lunch and dinner are provided at a nominal charge, on the island. Ice is available on the island at no charge. 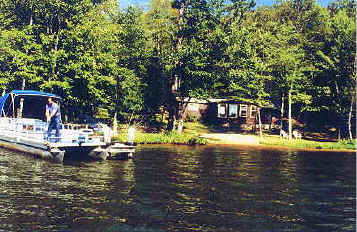 Each cabin has a completely furnished kitchen, living room area, bedrooms and bath/shower. Evening weather can be chilly at times, please pack accordingly.